U.S. President Donald Trump and first lady Melania Trump rejoiced Tuesday in the completed rescue of 12 boys and their soccer coach from a deep cave in Thailand. Wonderful to hear all 12 boys & their coach are out of the cave in #Thailand. What an amazing & heroic global effort! Wishing them all a speedy recovery. The boys and their coach were trapped when trying to evade flood waters that rose while they were on a team hike. They were stranded for more than a week before being found. Despite being located, the team was still stuck, as even expert divers were challenged by the route between the boys and the mouth of the cave. 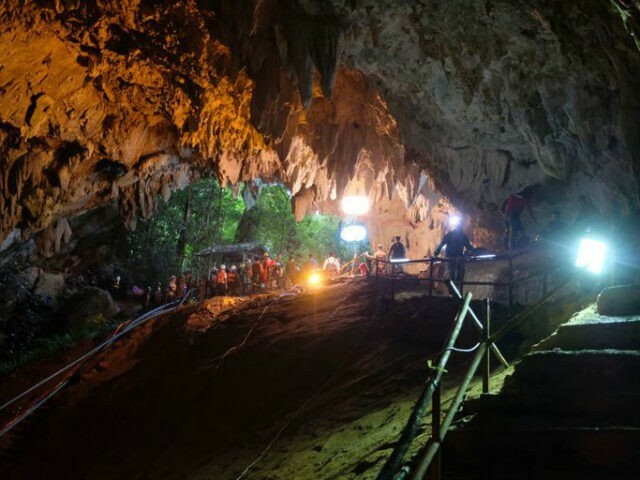 Several options for rescue were considered, but as oxygen availability inside the cave became a pressing concern, rescuers decided to attempt to guide the boys and their coach out through the more than two miles of perilous cave path. The boys and coach were taken out in several batches of extractions over several days that concluded on Tuesday. All remaining rescue team members in the cave after the team and coach were extracted were also able to get out on Tuesday. Rescued boys were taken to the hospital. One rescuer tragically died last week as rescue teams worked toward plans to extract the team.